The National Conference on Theosophical Education was held on Sept. 23-24, 2016, in Bhubaneswar, Odisha, India, hosted by the TOS Odisha Group. The purpose of the conference was to gather the different schools affiliated with the TS and TOS in India and to explore how to help improve the schools in integrating theosophical principles, upgrading academic standards and making them sustainable. The conference was organized by Dr. Deepa Padhi, 2nd from left in the photo. Towards the right are Vic Hao Chin, Jr., Chief Speaker of the Conference, B. L. Bhattacharya, National Director of TOS in India, Dr. Chittaranjan Sathapathy, Chief Guest and International Vice President of the TS. The guests at the head table are holding the Oriya translation of the booklet written by Vic Hao Chin entitled "Establishing Theosophical Schools." Group photo of attendees of 13th Indo-Pacific Conference in Auckland, New Zealand, Oct. 14-19, 2016. The new President of the Federation is Gerard Brennan of Australia. The theme of the conference was "The Why of the Theosophical Society." Tim Boyd, international President of the TS, was the Keynote Speaker. Dr. Roselmo Doval-Santos, President of the TS in the Philippines, speaking before retired justices of the Supreme Court of the Philippines last Feb. 24, 2016 on "Spiritualizing Medicine." The lecture was arranged by Justice Flery Ruth Romero, former president of the Soliman Raja Lodge of the TS in the Philippines. The Self-Transformation Seminar conducted last Feb. 20-21, 2016 at the Chinese University of Hong Kong by Vic Hao Chin Jr. A follow-up session is scheduled in June, 2016. Victor Penaranda, Vice President of the TS in the Philippines, during the annual convention of the TS in New Zealand, where he was invited as the guest speaker last January, 2016. Participants of the two-week School of the Wisdom in Adyar, Chennai, India, the national headquarters of the TS, on the theme: "Self-Transformation and the Spiritual Life" last December 1-12, 2015, conducted by Vic Hao Chin, Jr., former president of the TS in the Philippines. Bro. Mahendra Singhal, former International Vice President of the Theosophical Society, addressing the TSP national convention in Cebu City last Nov. 20-22, 2015. Members welcoming the newly inducted members of the Theosophical Society during the National Convention at Cebu City last November 20122, 2015. The Board has elected last January 5, 2015, the national officers among the trustees chosen last national convention. The executive officers are: President: Dr. Roselmo Doval-Santos; Vice-President: Victor Penaranda; Treasurer: Rekha L. Nahar; Secretary: Atty. Flor Garcia. The three trustees are Vic Hao Chin Jr., Saturnina (Bebot) Rodil and Charlton Romero. They will serve for two years. 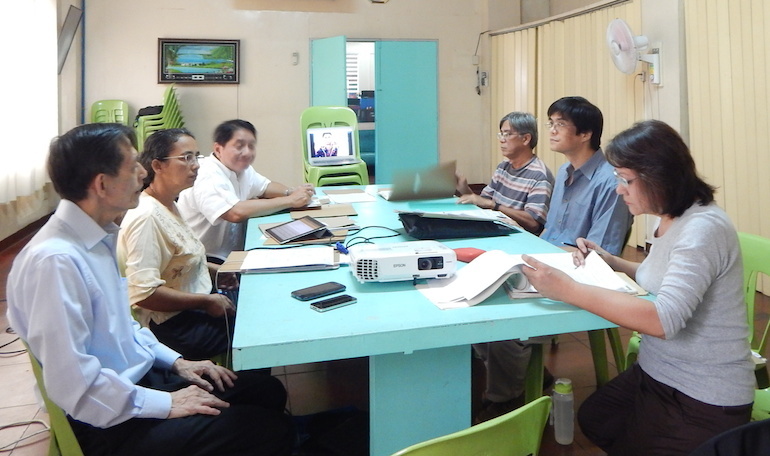 The photo at left is their first board meeting, with Bebot Rodil participating through Skype. A mindfulness training session with Golden Link College students conducted by Bro. Phap Kham of the Plum Village Community in Hong Kong. 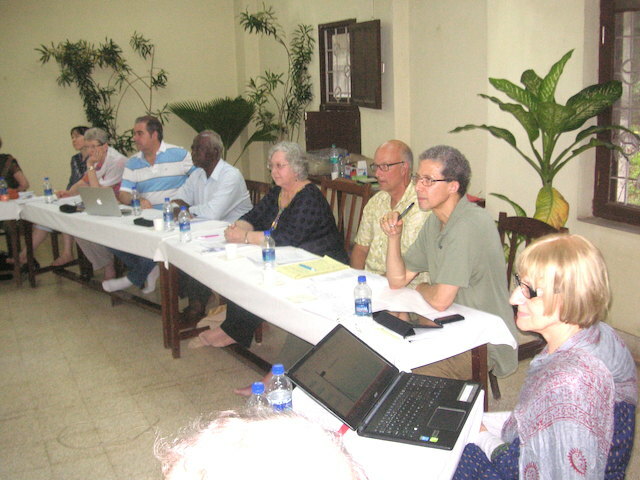 The International President, Tim Boyd, (2nd from right) convened an international Strategic Planning Meeting last January 1-2, 2015, attended by 26 members from various countries. Representing the Philippines was Vic Hao Chin Jr., who presented three papers to the conference. The gathering listed strategic goals under three categories. This was the first time such a planning meeting was held for the past almost 40 years. 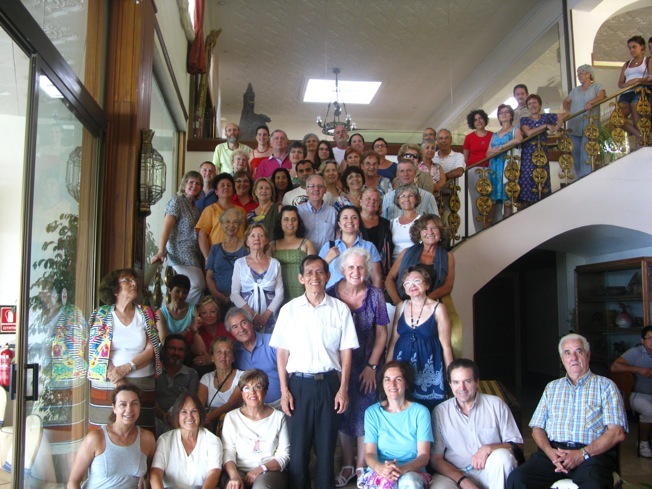 Vic Hao Chin, Jr., past President of the TS in the Philippines, conducted the December session of the School of the Wisdom at the International Headquarters of the Theosophical Society, Adyar, Chennai India last December 1-12, 2014. More than 40 participants attended coming from Canada, Australia, France, Norway, India, Israel, Russia, Brazil, Myanmar, etc. 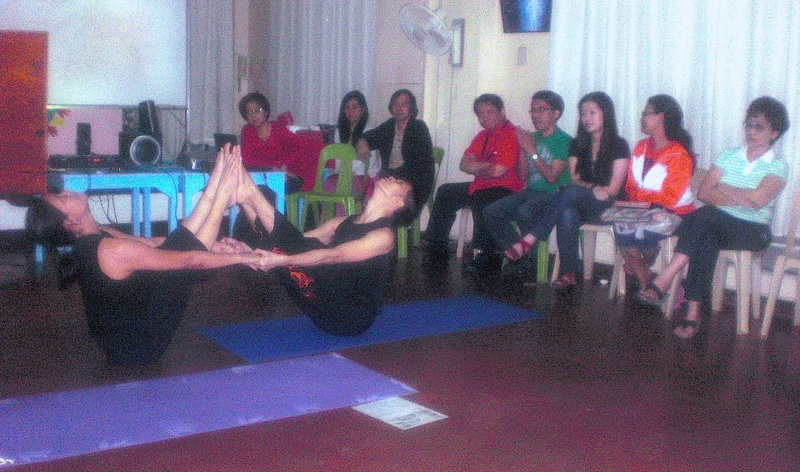 The theme of the class was "Self-Transformation and Spirituality." 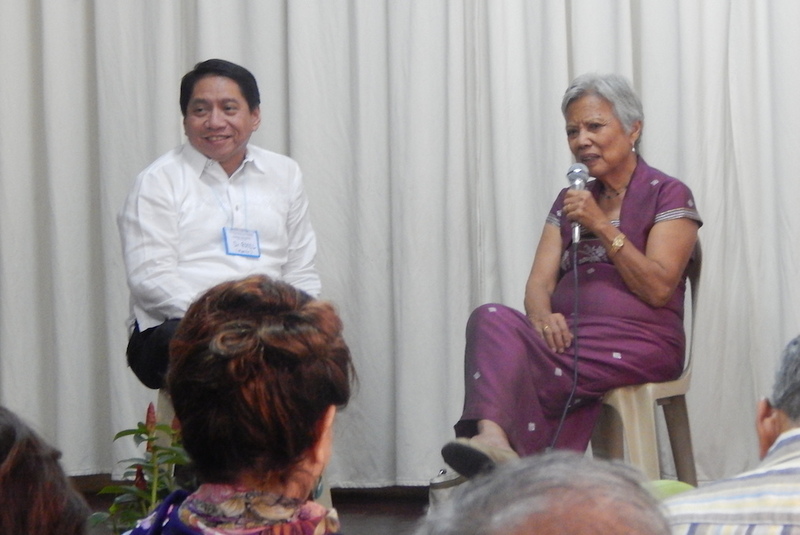 Former Senator Leticia Ramos Shahani (right) was the guest speaker at the National Convention of the Theosophical Society in the Philippines. She spoke about how the spiritual life in her work as a diplomat and senator of the country. 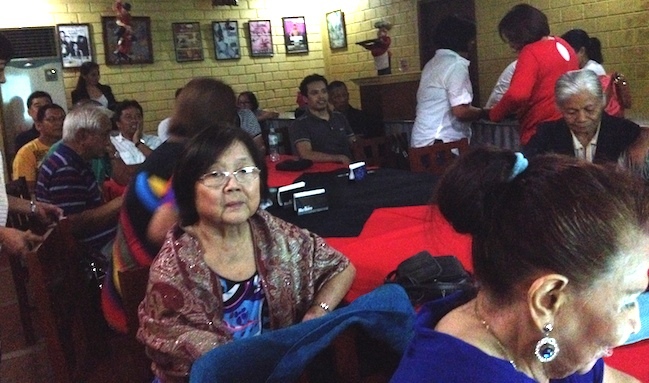 Dr. Roselmo Doval-Santos (left)and she entertained questions after their respective speeches. A Year-end Party was held last December 14, 2014 as a culminating event of the national headquarters. Songs, dances, magic tricks and games were performed by various members of the TS. A snapshot of participants of the 2014 National Convention during lunch break. 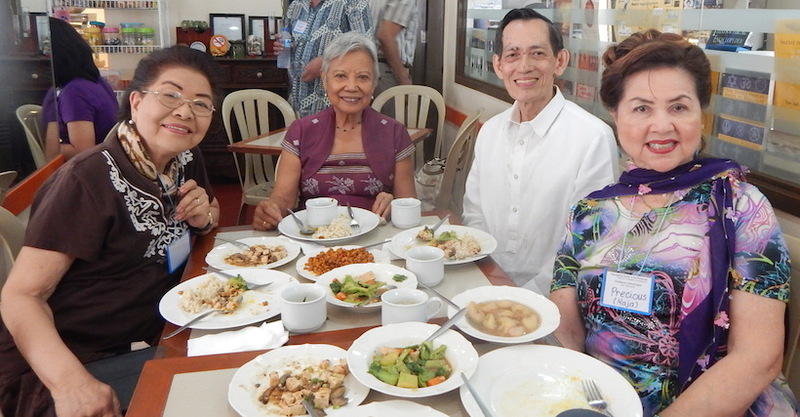 From left, Justice Flerida Ruth Romero, Senator Leticia Ramos Shahani, Vic Hao Chin Jr., Ambassador Preciosa Soliven. 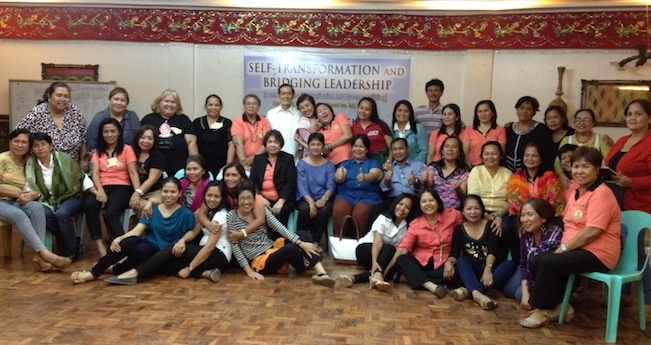 The Mayor of Iligan City in Mindanao sponsored a 2-day Self-Transformation and Bridging Leadership Seminar to selected officers and staff of the city government of Iligan, including elected City Councilors, last October 27-28, 2014. The Luzon Federation Convention of the Theosophical Society in the Philippines was held last June 28, 2014 at the National Headquarters with the theme: "Forming a Nucleus of Universal Brotherhood." 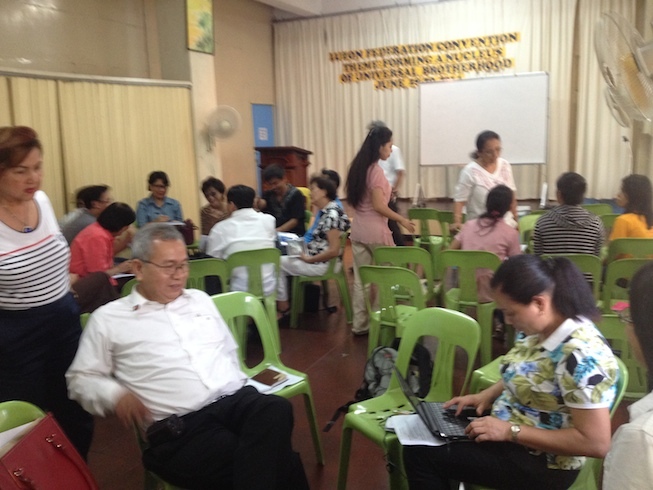 Photo shows the workshop of the conference where different clusters make their respective plans. 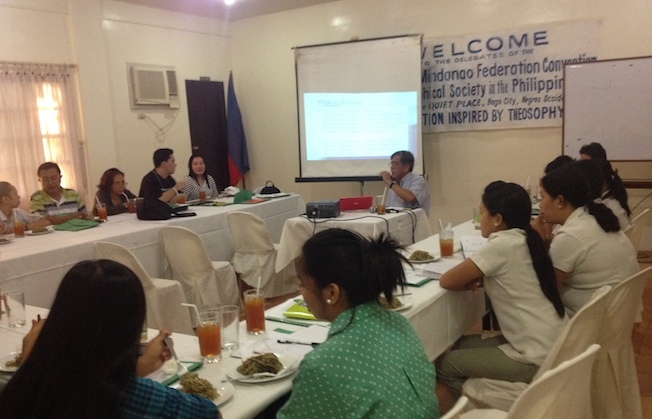 The 2014 Visayas-Mindanao Federation of the TS in the Philippines was hosted by the Bacolod Lodge last May 23-24, 2014 at the Quiet Place, Bago City. It's theme was "Education Inspired by Theosophy." 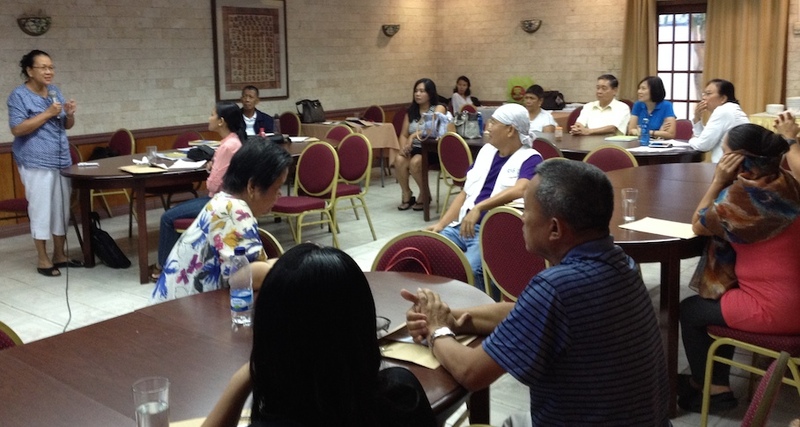 At left is a presentation being made by Vice President Victor Penaranda. 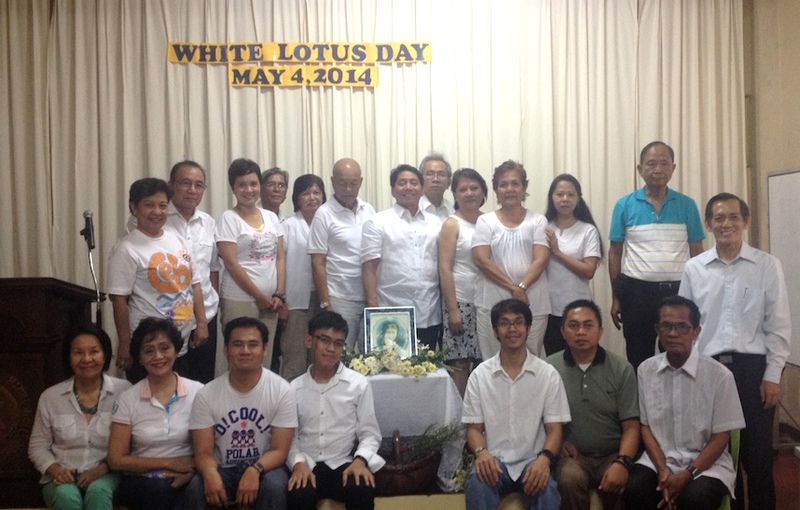 A White Lotus Day commemoration was held on May 4, 2014 at the TSP Headquarters in remembrance of the death anniversary of Helena P. Blavatsky, the principal co-founder of the Theosophical Society who passed away on May 8, 1891. 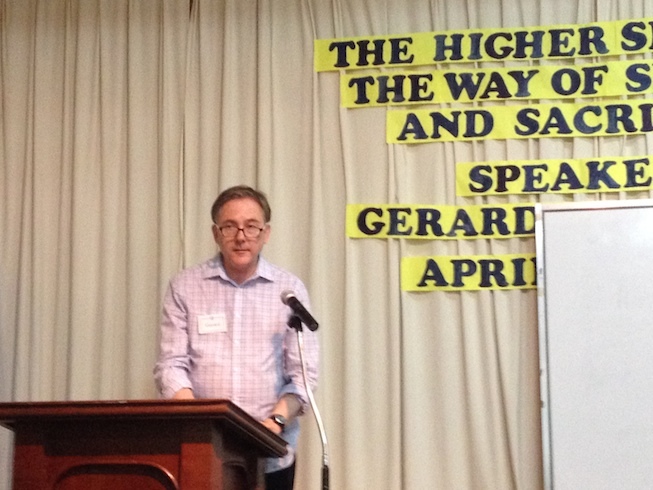 A lecture on "The Higher Self" was given by visiting lecturer Gerard Brennan of Australia last April 5, 2014. Gerard is a frequent volunteer teacher in Golden Link College where he teaches English literature. 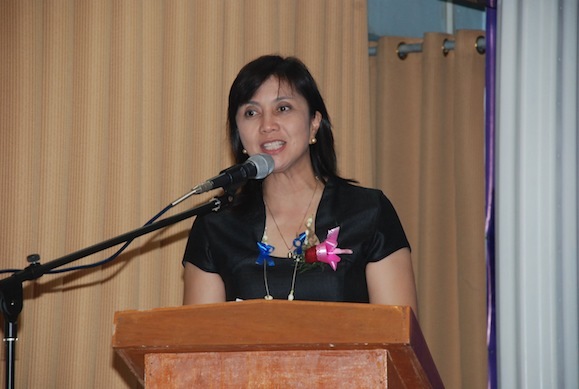 Rep. Leni Robredo was the Commencement Speaker of Golden Link College on April 4, 2014. Congresswoman Robredo is one of the leading exemplars of transparency and integrity in public service. There were 14 graduates in the college department. 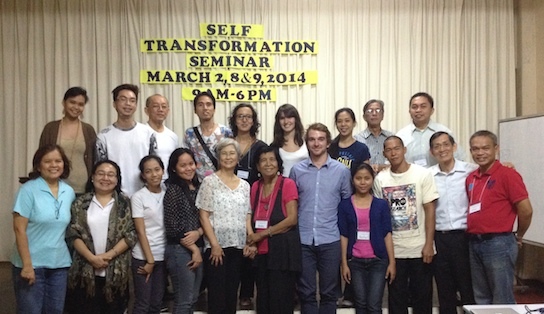 Participants of the regular Self-Transformation Seminar at the headquarters of the Theosophical Society in the Philippines held for three days, March 2, 8 and 9, 2014. Three of the participants come from France. 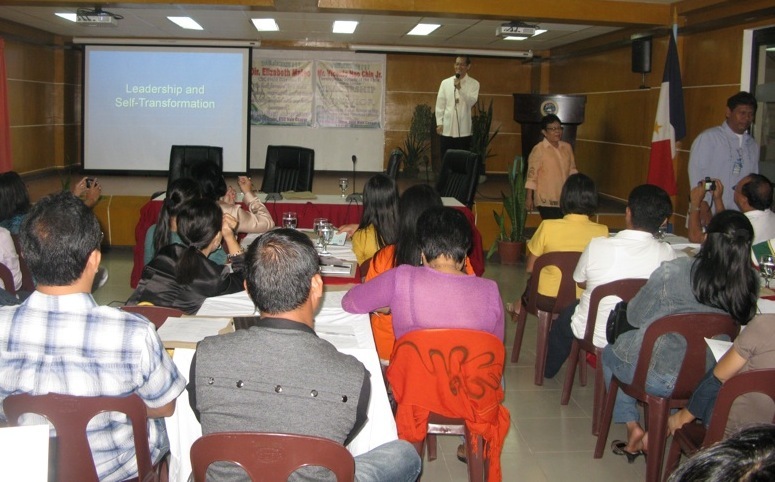 Self-Transformation Seminar conducted at the Mindanao State University - Iligan Institute of Technology last January 25-26, 2014. Conducted by Vic Hao Chin Jr.
A lecture on Self-Transformation was given by Vic Hao Chin Jr. to a joint gathering of several Rotary Clubs in Iligan City, last Jan. 24, 2014, in coordination with the Godea Lodge of the Theosophical Society. The TS in Indonesia sponsored a Self-Transformation Seminar in Bandung, Indonesia last January 12-14, 2014. 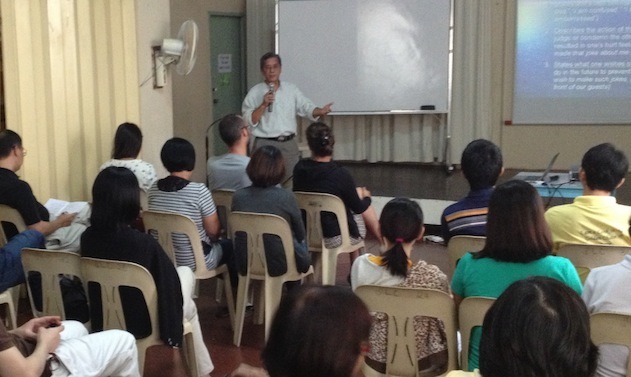 The seminar was open to the public and was conducted by Vic Hao Chin Jr. The TS in the Philippines and Theosophical Order of Service undertook a large scale relief operations to help the victims of the supertyphoon Haiyan (Yolanda) that devastation many towns and cities in Leyte, Samar and Iloilo provinces. 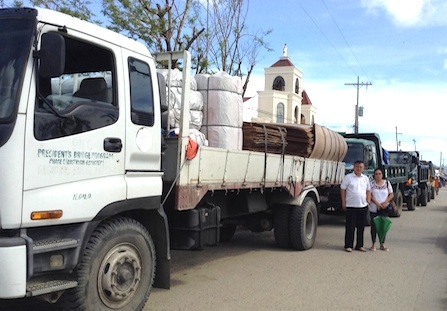 Photo at left shows the first shipment of relief goods loaded in many large trucks towards northern Panay island. In the photo are Victor Lo, President of the Iloilo Lodge, and Teresita Peregil. They coordinated the distribution in cooperation with several government agencies. 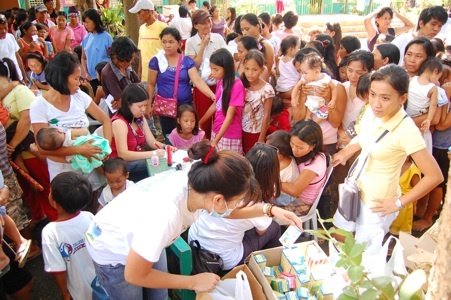 Many theosophists from all over the world sent donations through the TS in the Philippines. 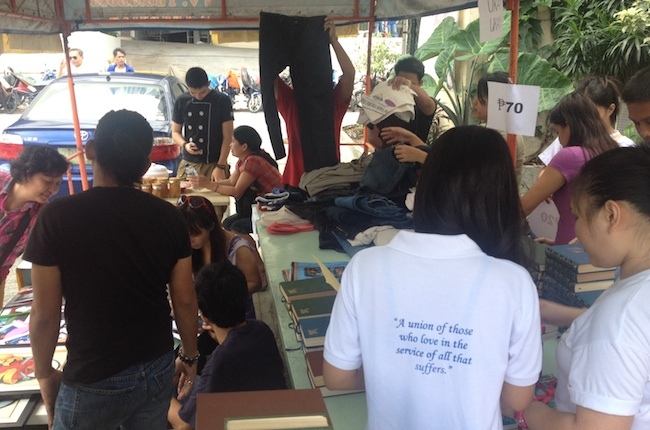 The TS in the Philippines sponsored a Tiangge or Flea Market in front of its national headquarters, selling books, clothings, gift items, health products, etc. last November 29, 30 and Dec. 1, 2013. The event also sponsored lessons in hatha yoga and taichi. It was organized by Asst. Administrator, Pat Munoz. 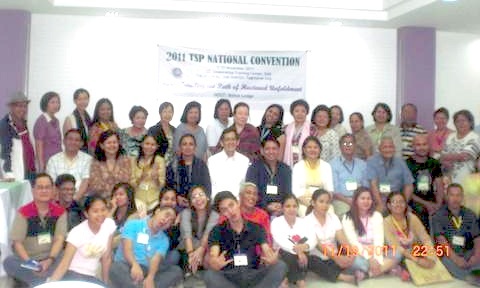 Despite the devastating typhoon Yolanda (Haiyan), the TS in the Philippines held its national convention on Nov. 15-17, 2013 in Iloilo City with the theme: "The Practice of Theosophy in Daily Life." The Indo-Pacific Federation of the Theosophical Society held its triennial conference at Bali, Indonesia, last Nov. 1-6, 2013. The Philippine section sent many delegates led by its president Roselmo Doval-Santos. 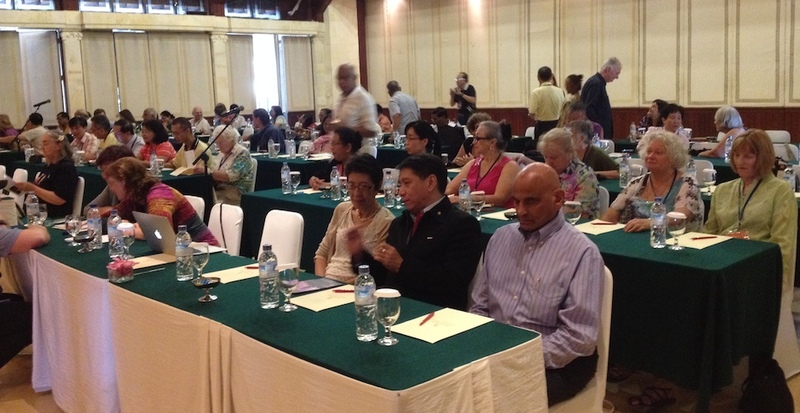 Photo shows Ravi Ravindra (rightmost, front row), one of the main speakers of the convention, seated next to Roselmo and Bebot Rodil of the Godea Lodge. Former TSP President Vic Hao Chin Jr. was invited to speak at the National Gathering of the TS in America as well as the third international TOS Conference in Wheaton, Illinois, USA. 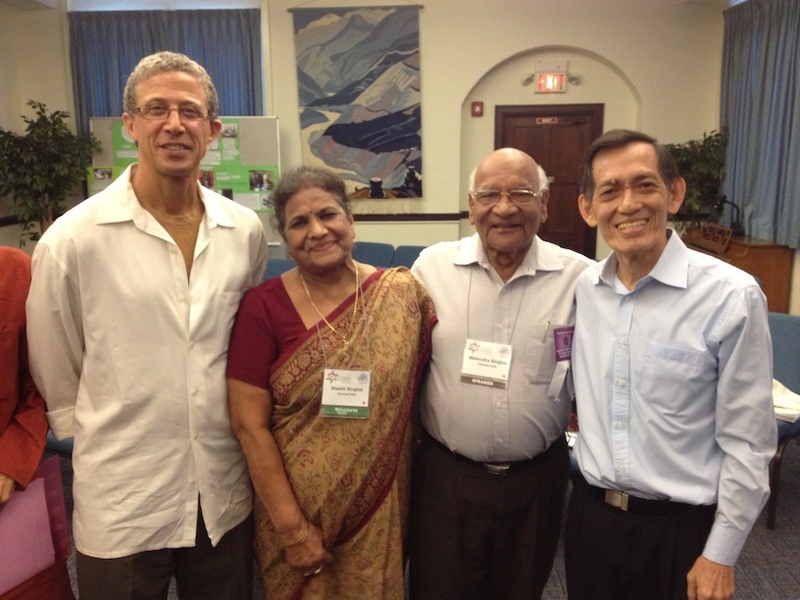 Shown in the photo are, from left, Tim Boyd, National President of TS in America (now International President), Mrs. Singhal, Mr. Mahendra Singhal, then acting President of the Theosophical Society international, and Vic. 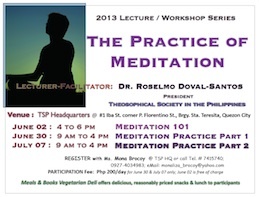 TSP President Roselmo Doval-Santos conducted a 3-day workshop on Meditation last June 2, 30 and July 7, 2013. It consisted on the cognitive and practical aspect of meditation. 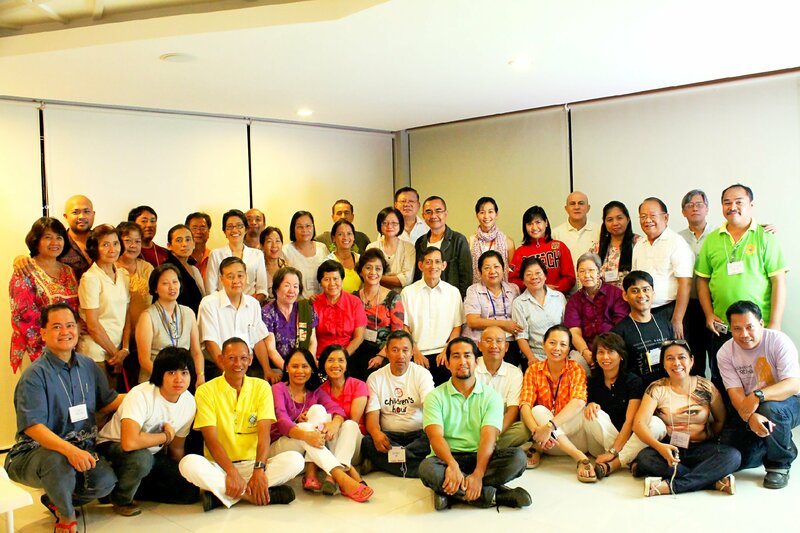 The 2013 Conference of the Visayas-Mindanao Federation of the TS in the Philippines was held at Cagayan de Oro City last May 17-19, 2013 with the theme: "Cultivating Wisdom." 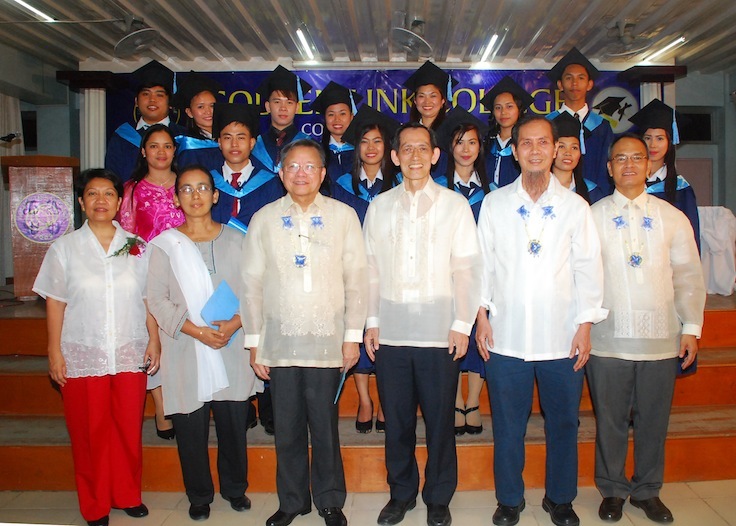 It was hosted by the Godea Lodge of Iligan City. 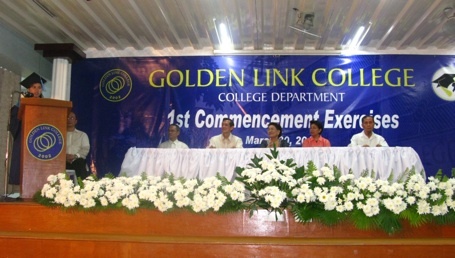 Former Chief Justice Reynato Puno (front row, third from left) was the Speaker of the Commencement Exercises of Golden Link College on April 19, 2013. There were twelve graduates in the college department in addition to graduates in high school, elementary and preschool. 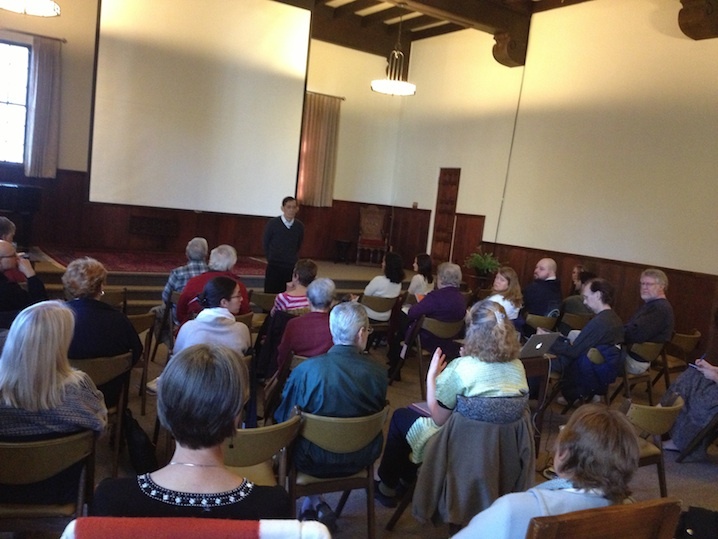 A Self-Transformation Seminar was conducted by Vic Hao Chin Jr. at Krotona Institute of Theosophy in Ojai, California last January, 2013. It was followed by a training workshop for facilitators of the ST Seminar consisting of members of the TS in America, who later conducted the seminar in various places such as Ojai and North Carolina. 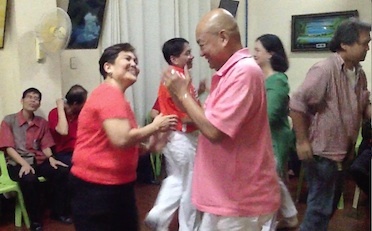 Music and dancing during the Year-End Program of the TS headquarters on Dec. 9, 2014, led by TSP President Rosel Doval-Santos and his wife, Tess (in green). 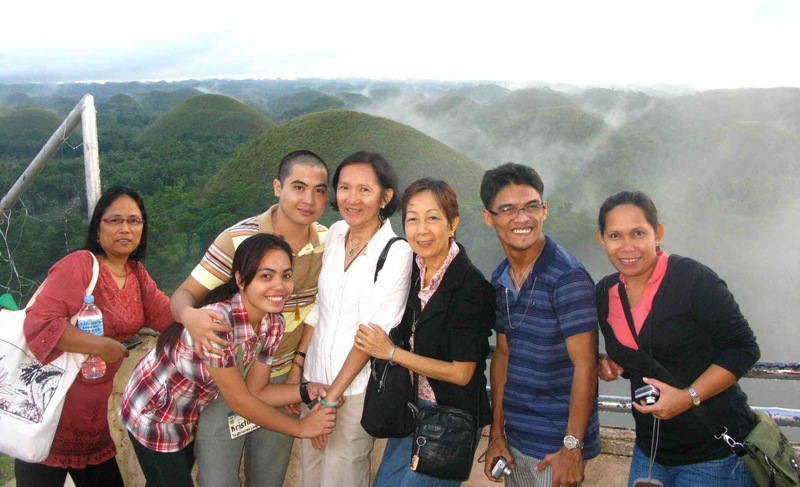 The 2012 National Convention was held at the national headquarters of the Theosophical Society in the Philippines. During the convention a new set of Board members were elected, and Dr. Roselmo Doval-Santos and Victor Penaranda were re-elected as President and Vice President respectively. Photo at left is the convention dinner where Victor Lo (in red striped shirt) is regaling the group with his jokes. 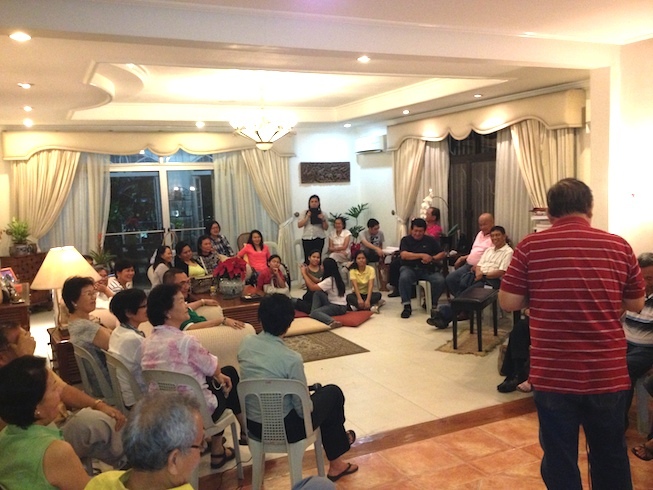 A Self-Transformation Seminar for the general public was held at the TSP headquarters in October, 2012. It was conducted by Vic Hao Chin Jr. and Victor Penaranda (in the photo). The TS continues to conduct the Self-Transformation Seminar for the military on the themes of inner and outer peace, leadership, service, meditation, self-mastery, values integration, etc. 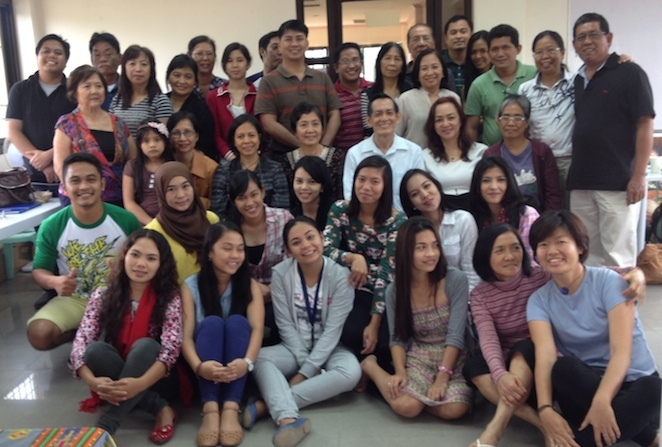 The latest is one for trainees in Tanza, Cavite, handled by Victor and Jo Penaranda, assisted by Marilyn Ranola. 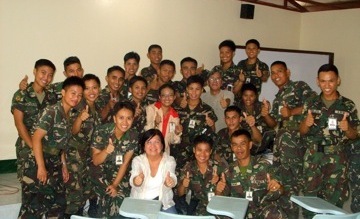 Previous seminars were given to the Philippine Military Academy and to field combatants in Mindanao. 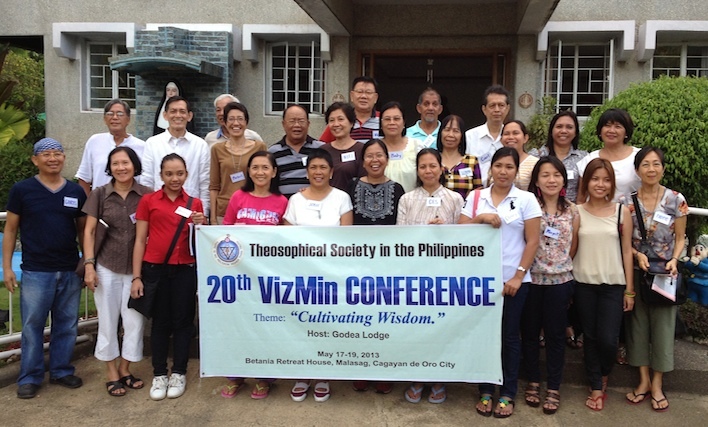 The 2012 Vismin Federation conference was held in Cebu City and hosted by Cebu Lodge and Satsang Study Group. On its tenth anniversary, Golden Link College held its first college graduation with six students finishing their bachelor's degrees in Education. Guest speaker was Justice Flerida Ruth P. Romero, who exhorted the graduates to practice discrimination, self-control, service and self-sacrifice in their daily life. 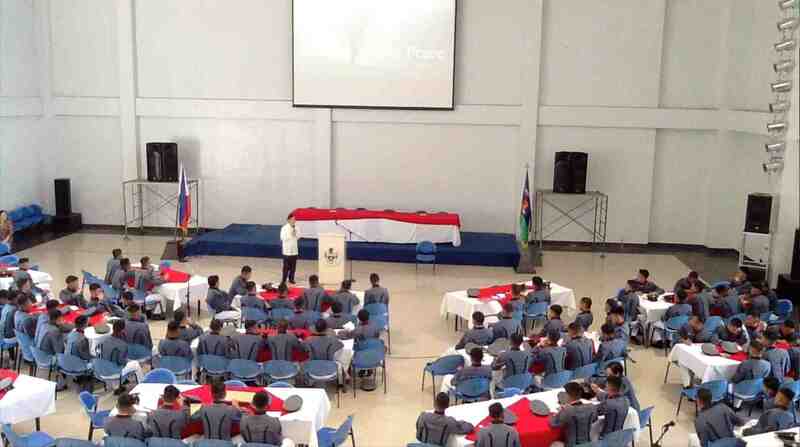 A half-day seminar to the graduating class (about 190 of them) of the Philippine Military Academy in Baguio was conducted by Vic Hao Chin, in collaboration with Balay Mindanao. The subject was Inner Peace, which covered self-awareness, meditation, processing and moral integrity. 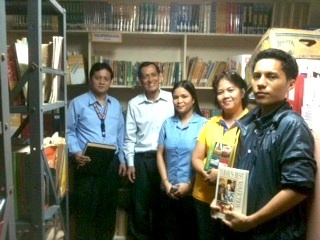 The TS in the Philippines national headquarters has just opened a new vegetarian restaurant called "Meals and Books." It offers a full meal at P65.00 (US$1.50). 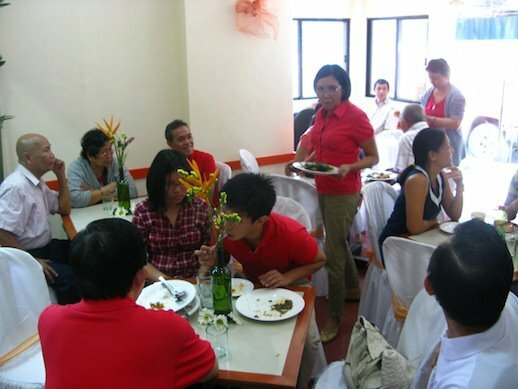 The restaurant is run by Claire Villanueva as a consessionaire. It had its soft opening last Feb. 22, 2012. It opens from 10:00am to 8:00pm everyday (except Monday) at 1 Iba St., Quezon City. Organized by Godea Lodge of the Theosophical Society in Iligan City, one of the two worst hit city during the last typhoon that claimed more than a thousand lives. The TS in the Philippines and Godea Lodge raised more than P300,000 and the funds are now used for food, blankets, medicines and other needs for evacuees of both Iligan and Cagayan de Oro. Our partner in Cagayan de Oro is Balay Mindanaw Foundation. 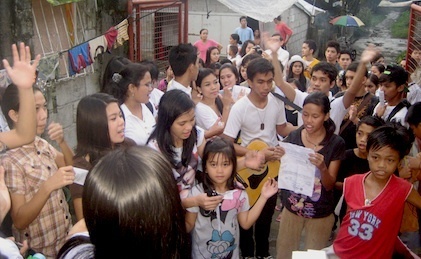 Students and faculty members of the Golden Link College visit the poorest families in northern Caloocan City and sang songs, distributed groceries and gave educational toys to children. Shiri Villanueva emceeing the yearend get-together. The party even had magic performances by members. 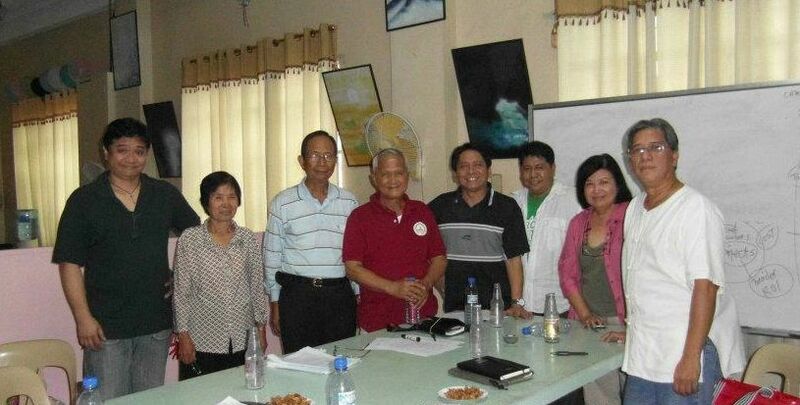 To prepare for the future fund needs of the work of the TS, the TSP President, Rosel Doval-Santos (center in dark t-shirt) has organized a group to study approaches in raising funds for the various projects planned by the section. Theme is "Treading the Path of Hastened Unfoldment." The convention started with a half-day retreat. 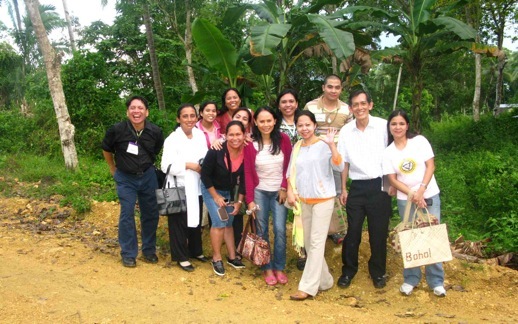 Here is the group of members who visited the future site of the Golden Link College campus in Cortes, Bohol. The site is 1.1 hectares and is walking distance from the main road. A talk to about 700 graduating students on the importance of character in preparing for one's adult life. A seminar for the provincial-wide Bohol Administrative Officers Organization, including all government offices and state colleges and universities. The Theosophical Order of Service and Golden Link College have been donating books to various public schools which have scanty collections of books in their libraries. So far about 10 schools and a university have been the recipient of donations. The photo at the left is during the donation to the University of Caloocan City. 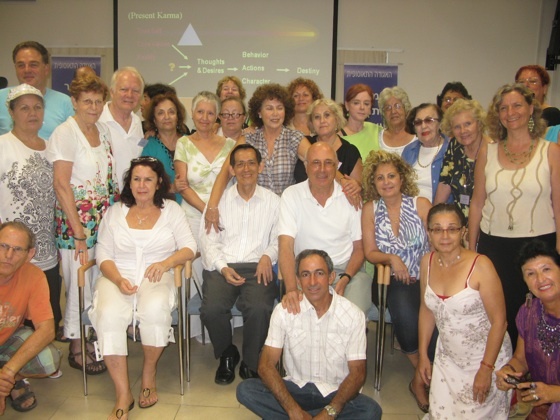 A three-day seminar conducted in Tel Aviv under the auspices of the TS in Israel. 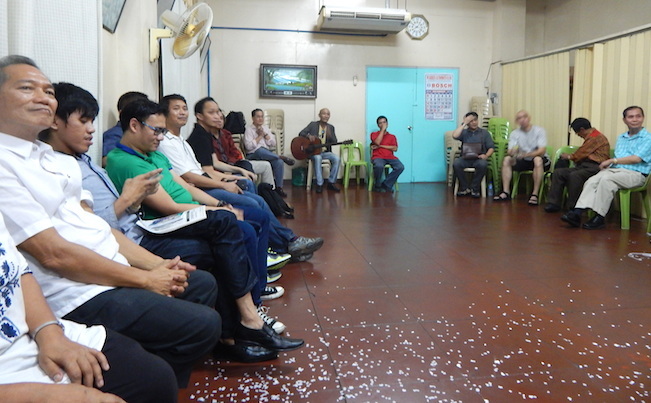 Seated at the center to the left of Vic Hao Chin is Abraham Oron, head of the TS in Israel. Conducted during the Summer School of the TS in Spain near Barcelona. The seminar was attended by TS members from all over Spain. 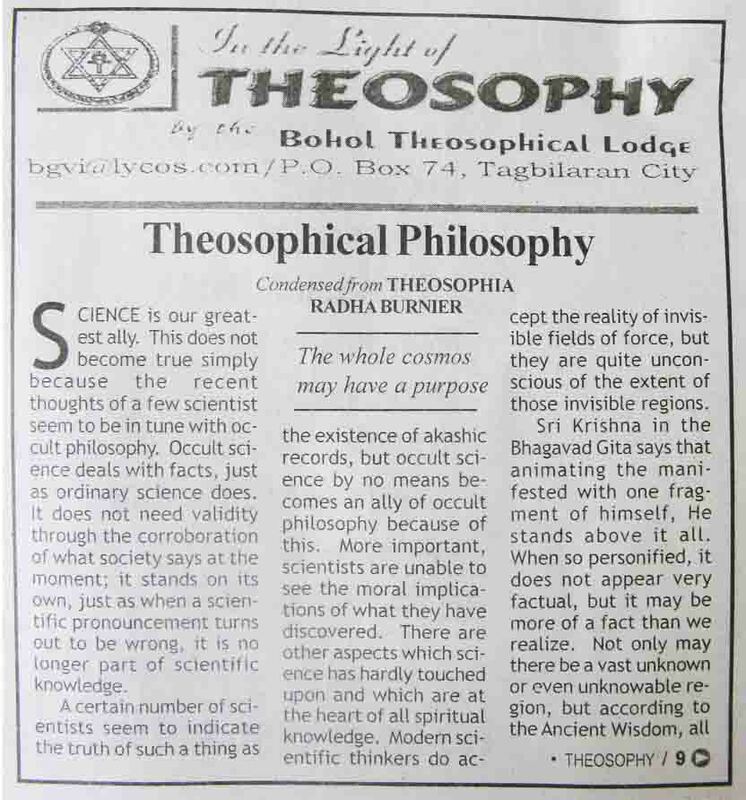 For several years now, the Bohol Lodge have a regular column on theosophy in one of the leading weekly newspapers in Bohol. An example of one of the articles is found in the photo on the left.